Very tasty whisky with a slight but noticeable peat influence. light smoke, sherry, oak, currants, quite light, but still spicy, a bit of campfire is also there. mild, gentle, the peat is there, not overwhelming, a bit burned, grassy, oak and tart sherry flavors. Tart, slightly bitter, slightly sourish fruitiness, dense smoke, slightly musty finish, but not unpleasant. Smoke, fruits (apples and some yellow fruits), hints of oranges, honey, vanilla. Smoke, caramel, fruits, hints of oranges, honey, vanilla. Medium to long. Oak, smoke, salt, fruits, some salt. Full, creamy, peppery, salmiak / lakrisal. Also sweet, honey, caramel. Orange. Medium, salmiak, light peppermint, honey. it would have been much more interesting at 46% I think. 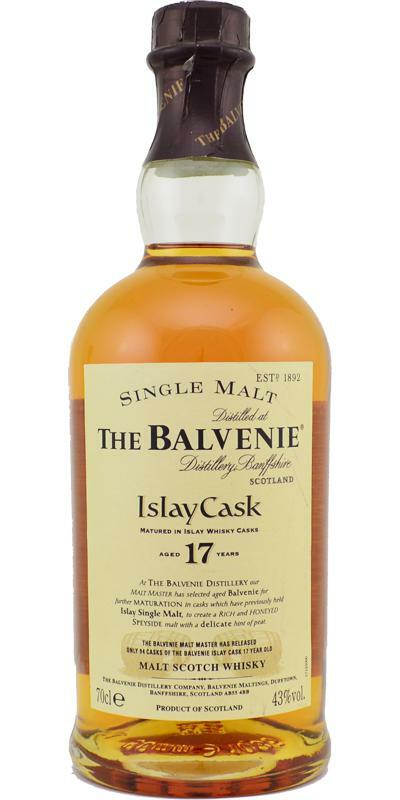 it starts a little "soft knee", and then it settles in the delicate and fluffy style of Balvenie. I hardly feel the peat ... A little hazelnut. Body: a touch of syrupiness in the middle. Restrained, but distinct, seaweed and salt. Honeyed,then some peaty smokiness. The smokiness is enwrapping, rather than attacking , as it might be in an Islay malt. Fragrantly smoky. Orangey flavours emerge. Lively,emphatic finish. tasted before - I know I'm a little late. let's just check what 'the glass' says. twenty bottles of Ardbeg into each cask. beautiful finish. What a great balance!